Nah, TCRF only has differences between region's on that page. You have a TCRF account? That's cool! It would be very nice if you can double check on the mugshot. Can it be that the unused sprites of Bulma don't show maybe because her sprites are out of bound, kinda like the hidden rings in SA2. I guess the real reason why those Bulma sprites are unused shall remain a mystery. Seeing what get's scrapped or changed in games is interesting for me. Oh right, I guess I assumed TCRF already had it for some reason, heh. Yeah, I might add it actually, thanks for the idea! 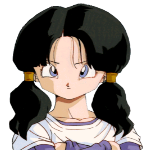 Also, I'm fairly sure I didn't miss an unused Bulma mugshot, I could double check at some point, though. As for why they didn't use it, I have no idea. I figure she should have appeared standing at the beginning of the first stage, sort of like how she's standing at the beginning of the pirate cave level, but doesn't show up for some reason? Hard to say for sure. This should be added to the cutting room floor! Could there also be an unused mugshot of Bulma in this outfit!? I wonder why they didn't use those sprites. When does bulma wear her pink dress in the game? Is it unused or something, this is the first time I've seen it.